On New Girl Season 5 Episode 13, Jess is finally offered the job of her dreams at a progressive school, but things take a turn when her ex-boyfriend shows up. When you watch New Girl Season 5 Episode 13 online you'll realize how important an apology is to someone. Jess is finally offered the job of her dreams at a progressive school. She goes to tour the school with the principal Genevieve and falls in love even more with the idea of working there. Unfortunately, after taking the tour, Jess is introduced to Genevieve's boyfriend who turns out to be her ex-boyfriend Sam. Jess and Sam admit to a relationship, but Genevieve doesn't say anything and instead leaves with Sam. At the loft, Jess asks for advice on what to do and the roommates tell her to leave it alone, but Jess can't. Jess goes to Sam's apartment and finds him and Genevieve there and pleads with Genevieve to give her change. Genevieve realizes Sam can't move on because he still has anger in him and wants an apology from Nick for kissing Jess. Jess arranges for the two guys to talk, but Nick refuses to apologize for kissing Jess because it lead to a fantastic relationship. Sam gets mad and shows his true self to Genevieve and she breaks up with him and offers Jess a job at the school. Want to see what else happened? 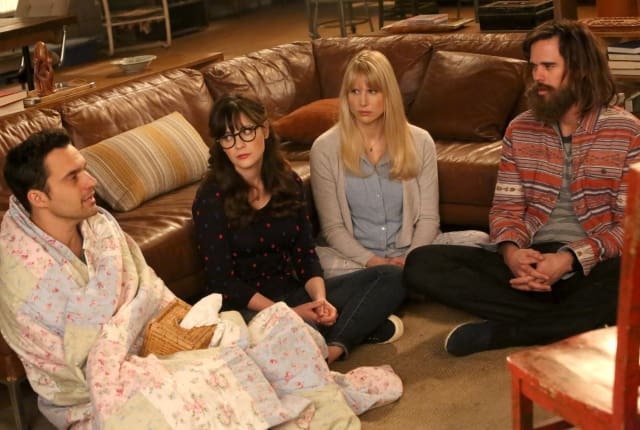 Go watch New Girl online now via TV Fanatic. On New Girl Seaosn 5 Episode 13, Jess' hopes for a job at a progressive new school may be jeopardized when the principal is dating her ex-boyfriend.